We all know that Illamasqua is amazing and they come out with some really great nail polishes, right? Well they have a new collection called Boo! and Hiss! They are “duo collections” meaning they are each paired with a complementary color. Boo! is paired with Baptiste and Hiss! is paired with Boosh. I have Boo! to show you today and I’ll be showing it paired with Baptiste, Phallic and Poke (all which I have reviewed on their own in the past), all fabulous colors in their own right! Enjoy! Boo! 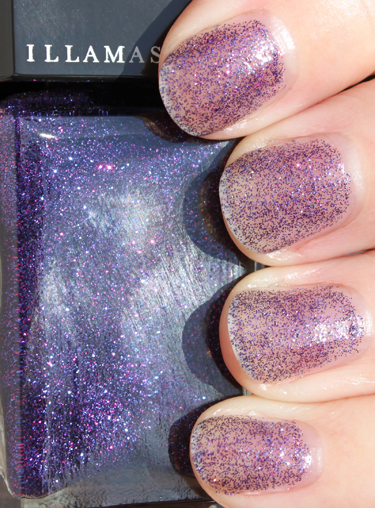 is a clear polish with very fine purple, pink and blue glitter. On it’s own it’s not all that special. This is two coats. Once you put Boo! over Baptiste though, then you can see the possibilities. 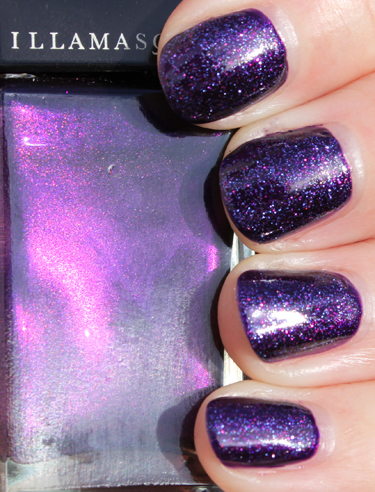 This is gorgeous, purply goodness! This was two coats of Baptiste and one coat of Boo! Boo! over Phallic is also totally beautiful. 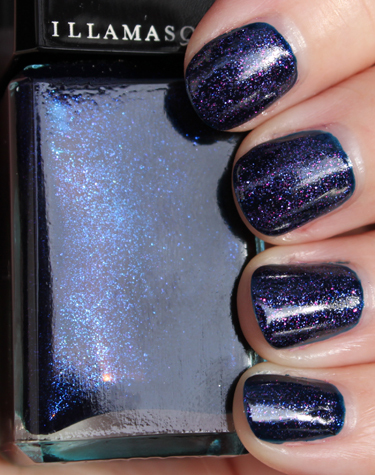 Phallic is a dark shimmery blue and this just adds a great glittery depth to it. This was two coats of Phallic and one coat of Boo! This one wasn’t as great as I had hoped. It does still look kinda cool, but I like Poke on it’s own rather than having Boo! over it. This was two coats of Poke and one of Boo! You can find both Boo! and Hiss! on Illamasqua’s website here. They do not have these at Sephora’s stores or Sephora websites, unfortunately. The price for the set is £25.00 which is about $40.00. Would you happen to know if Boo is similar to Sephora by OPI’s Too Good For Him? I have a sephora giftcard I still need to use, and it’s been ages since Rampage’s been restocked. I just saw Too Good for Him online yesterday and it definitely looks similar in the bottle. I haven’t seen it in person though, so I don’t know for sure! .-= TipsToToes´s last blog ..Color Club Revvvolution =-. Good with Baptiste. But not a must-have. Definitely best over the Baptiste for me!! Really pretty like that! 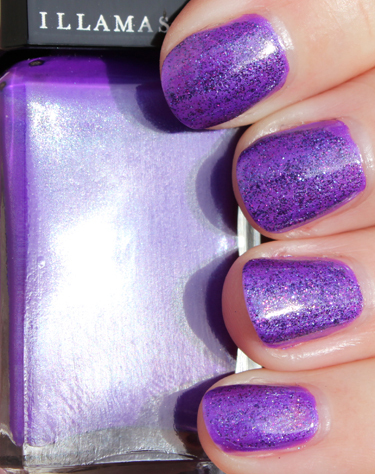 .-= rijaH´s last blog ..NOTD // Essie – Lollipop =-. Mislabelled Collide boxes at Sephora NYC and Boston have been spotted with Boo Inside. Thankyou for the comparisons over the other polishes. Got to say, I like it over Baptiste myself too. In fact – guess what I published on my blog today? I can see Boo having a lot more mainstream appeal than Hiss, which seems to appeal to the die-hard laquerheads only. .-= Helen´s last blog ..Illamasqua Boo =-. You made me want to get the Illamasqua’s that you used as base colors–those are beautiful. .-= Amy´s last blog ..Chanel Spring 2010: Empriente de Chanel Radiant Glow Highlighting Powder (Poudre Eclat Illuminatrice) =-. I’m not so thrilled with this. I can find a much cheaper purple glitter to layer over Baptiste. Phallic…interesting and dirty word for a nail polish..